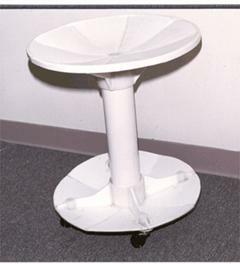 This 1994 photo shows a high density polyethylene (HDPE) stool built by J.M. Nichols Designs of Old Saybrook, Connecticut. Engineering drawings were made. This unit was based on a dimensioned section view of this sketch lacking the container. Note that it is made by joining cut pieces. Easily supports 220lbs.(99.7kg.) The casters have been replaced with furniture glides covered with rubber cane tips. When used in the yard or garden some tasks are more easily done seated. A stool with container should be made for demonstrations to determine consumer demand before selecting construction material and marketing. Also, a reinforced socket is needed where each foot is placed as seen in the above photo. Copyright © 2009 Axxxtion Atelier, Inc.